1) A device that sends a signal to a coal plant to burn more coal or natural gas. 2) The end point in a vast network built around the burning of fossil fuels. 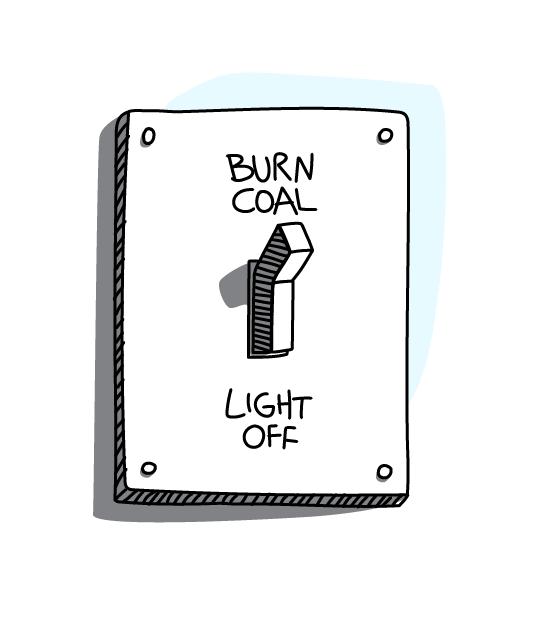 On the other end of a light switch is a coal plant and flipping a light switch results in the burning of coal or natural gas, adding adds more CO2 into the atmosphere and more mercury to the soil, lakes and oceans. The difficulty of seeing the relationship between the flipping a light switch and the burning coal at a location remote from that switch allows people to believe that no harm results from this action. Due to specialization, we do not observe the efforts of those who act as our proxy and who mine for the coal, transport it, and incinerate it. But the action of flipping the light switch makes possible and endorses all of these actions. For people who use only solar or wind as electricity sources, the light switch is a support for the further development of these energy sources. 1) Share this definition with others. 2) Purchase electricity for your home or business from a company that generates it from renewable energy sources. Here is a list of renewable energy electricity providers in the United States. 3) Support the idea of a carbon tax in local, state and federal legislation. 4) Sign petitions in favor of a carbon tax or that seek to end government subsidies for energy companies that use fossil fuels. 5) Explain to others the benefits of renewable energy use or assist others with the conversion to renewable energy providers.